Please note, developer support for PHP 5.3/5.4 was withdrawn as of version 3.
development tool to create (hard) currency classes. Uses publicly available currency definitions. Dealing with currencies is a pain in the arse. To get it right you have to wade through loads of stuff about locales, symbols and language names, when in fact all you want is a simple way of defining a currency. This library is aimed at removing a whole bunch of complexity. You can simply use the supplied Factory method to create a currency object, or if you know you are only dealing with a few chosen currencies, use a utility program to generate 'hard' currencies into you own project namespace. a utility to create 'hard' (i.e. 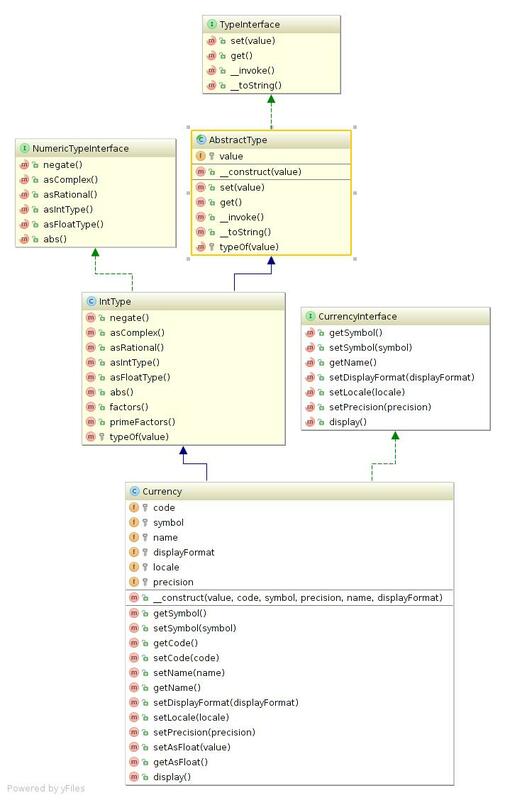 concrete) currency classes for your application as the Factory method utilizes a 20k line xml currency definition file and could be too slow for your requirements. a utility to generate the currency definition file from publicly available data sources. If you want more, either suggest it, or better still, fork it and provide a pull request. If you feel like helping, the data/symbols.html file needs a/ refactoring into an xml file and b/ having missing symbol definitions added. Take a look at docs/missing-symbols.md as a starting point. Most of the missing information is available on Wikipedia, but it is a manual task to transcribe. In both cases, $gbp->get() (or simply $gbp()) will return 120026, i.e. an int. As alluded to above, the Currency class is based on the strongtype IntType. This is because integer maths is far more accurate than floating point maths and if you were to throw some Currencies at the Chippyash/math-type-calculator then the results would be more accurate and consistent. The class knows how to convert to/from int/float using the precision parameter and can therefore maintain long term accuracy. Please note that the strongtype magic __toString() method, will return the value as stringified integer. Use the display() method for locale aware display of the currency. Let's say that your application is only interested in using AUD, GBP and USD. From a processing point of view, constantly having to query the currencies.xml file, which although optimized, is still large, and is potentially an expensive process. A utility is provided to enable you generate 'hard' currency classes to disk. You will need to have installed the library via Composer with dev requirements (default for Composer). The utility can be found at bin/generate-currency-class.php. destDir: target directory to write code to. As previously stated, we are missing some symbol data in the data set (see docs/missing-symbols.md). If you update any of the files in the data/ directory, you will need to run the bin/create-currency-data.php script to regenerate the src/Chippyash/Currency/currencies.xml file. Then run the src/Chippyash/Currency/currency-type-xsd.xsl translation against the resulting currencies.xml file to create the src/Chippyash/Currency/currency-type.xsd. Run these before any pull request to make changes to the data set. Please note that CLDR do not provide some currency names for a small set of locales. The Currency\Factory will default to using the base language translation if it can find one, or the English name as a backstop. Where a symbol cannot be found for a Currency, then it will default to using the ISO4217 code as a symbol. symbols.html NB - scraped from the page. If you know a better source, please let me know.